I know that Alex O’Loughlin puts 110% into the work he does. It’s his work ethic that drives him. I read once that he took a Sunday afternoon to practice one stunt for Hawaii Five-0. Now, that’s dedication…and he loves his work. After grinding out eleven episodes of Hawaii Five-0 so far, can he continue the pace? This article appeared in the April 14, 1973 issue of the AUSTRALIAN TV WEEK. 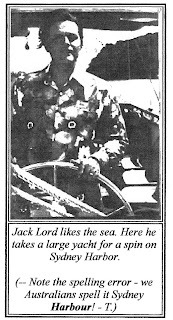 Sounds like Jack Lord set a precedent….or did he? HAWAII FIVE-0 star Jack Lord is a man who insists on relaxation. Even on a whirlwind promotional tour of Australia the well-muscled giant insisted on time off to enjoy the scenery. Which is why he took a boat trip around the Sydney Harbor, an attraction which never fails to get visitors from the States. Jack, back home in Hawaii, completely revolutionized television series-making all on his own, because of his insistence on peace and relaxation and shorter working hours. When Jack first put his foot down the television producers howled and said it couldn’t be done. Hear that CBS? If you want to pay homage to Jack Lord and the original Hawaii Five-0, how about giving your people some much needed down time as Jack Lord insisted he and “his people” have? Take time to smell the hibiscus. One of them mentioned that they have a 12-16 hour day 6 days a week. I guess it might sound stupid and I am not that well informed, but is that normal for shooting a film? Well I guess you cant compare the film buisness to a "normal" job but isnt that a little too long?